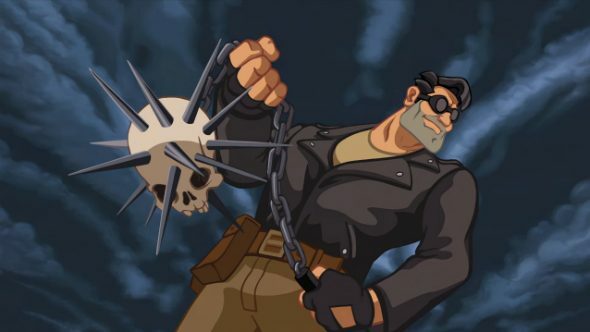 Double Fine’s biker adventure Full Throttle will be getting a spit-shine and popping out on PS4 and PC in the near future, to help you visualise what that looks like there’s a trailer of the new art style. For more classic PC games begging for a remaster, check these out. Given that the original Full Throttle, predecessor to such Schafer classics as Grim Fandango and Psychonauts, was during the lost “pixelated” era of video games, there’s a lot of ways to interpret how the game would look today. Seems the folks at DF reckon it was very much a cartoonish affair and have given it some smooth animation love to bring the retro-futuristic adventure into the century it’s set in. As with most DF remasters, expect this one to have the option to look back through the grainy goggles of yore if you’re not getting those fuzzy nostalgia vibes from playing with clean graphics. The trailer, from the PSX stage last night, suggests the game will arrive on Sony’s console sometime next year so PC will feel the benefit then, too.